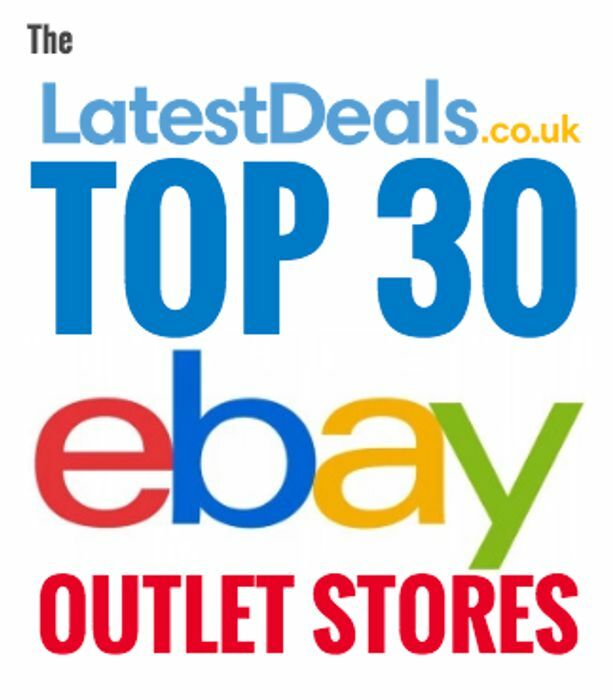 LatestDeals’ Top 30 eBay Outlet Stores UK Guide. Find mega bargains and huge discounts up to 90% off at the best UK eBay outlet stores! Our favourite eBay outlet stores are a fabulous hunting ground for brilliant deals. Nice one. I didn't know most of these stores had eBay things. Tesco seems to have some good deals on there as well. Great to have this handy list of eBay Outlet Stores and Shops pulled together. Thanks Tom ! I just used the Argos eBay outlet store to find a new men's bicycle. It's a great way to save money. This is a brilliant post, thank you Tom. Great idea and very useful information. There are big discounts in the Currys eBay outlet store right now, during the January sale. This is a great way to save money and find some big bargains. It's interesting how Argos allows many brands and 3rd party sellers to take advantage of the 'click and collect' service eBay have with the retailer. 9th January 2017 - The Co-Operative Electrical ebay store currently has a sale on where you can save money on ovens, tumble dryers, speakers and televisions. It all includes free delivery. Got same problem, if seller doesn't sort it contact EBay or PayPal, keep copies of all correspondence! I've been in this situation. EBay and PayPal will ask you to return the items with proof of posting before a refund can be given. In my case I didn't bother because the return cost was more than the value of the item. I just had to bin the item. why wouldn't you have to send them back!? They're wanting proof that they are damaged, in my opinion I think it's fair enough that they would want the damaged ones sent back for the refund to be made. Just like if you bought it in person at a shop, you would bring back the broken one and get a new one or a refund? Think it depends on the seller.I bought some incense crystals that had all spilt out of the original bags and mixed together in the jiffy bag.The seller just sent out new and told me to keep the "damaged"
I sell a lot on ebay. The buyer does not have to refund you if you do not return the damaged item. As mentioned we only have one of the boxes , and we have sent proof that it is damaged in photos. I have a feeling they won't refund unless they have both boxes back. I wouldn't usually mind but it's the one present my daughter has asked for. Contact ebay and explain that you threw first one away as seller was replace g and see what they say? I'm just wondering why they said no refund and will send a replacement. Replacement arrives in a shocking state and if I still had both and sent them both back I would lose out. Postage would be almost as much as I paid for them. I bought a pot house lamp and it came cracked and broke. We could tell it was broke as soon as we started to take it out of the box. So we started taking photos straight away to show them. If you paid via PayPal and are still within the time limit for raising a claim there, then please do so. They may want to see pics of the damage, but I would expect them to refund you (taking the money out of the sellers account) without you having to post anything anywhere. Also be ready to forward them emails from the seller insisting you return them at your own expense. Hi. Thanks for your reply. We paid £17 for it and my 5 year old daughter could have made a better one with some sticky back plastic and a yogurt pot!! They have now put price up to £40!! Both boxes arrived in a flimsy carboard box too big for it with a thin piece of bubble wrap around it, allowing for ample room for the item to move around during transit and thus becoming damaged. When I complained through paypal they sent me a prepaid return label. Open ebay /paypal case ..they aways side with the buyer ..
Yeh I bought some games from ebay and the discs were scratched - the seller was being a nightmare to get a refund, but as soon as I contacted ebay and told them I paid by PayPal they got it sorted within 48 hours. I still shop there as it's a lot cheaper most of the time. Another super interesting post I found on Facebook about ebay outlet stores - you can spend your Nectar points on eBay! Hi really silly question, but how do u buy stuff of eBay with nectar points please? Blimey, you learn something new every day! Plus, in November 2016 someone got a message from Nectar saying she could redeem the points towards her next shop on eBay, and they'd give 30% of her points back. She said, "NECTAR + EBAY DEAL. Received on Nectar app. On reaching 2,000 points. Spend points on ebay and receive 30% back. Not as good as Nectar DoubleUp starting soon, but maybe covers more categories. It is time-limited, probably a week, as I now have 4 days left." Great to spend on ebay outlet stores. Update 10th January 2017 - Argos has got a sale on it's official ebay outlet store. Plus you can get 15% off when you spend £150 or more on selected indoor furniture. Ann Summers has a half price sale on its eBay outlet store. Take a look through the link posted in the article above. Also, stockings are buy one get one half price. Which stores are on eBay? Before buying something in a sale, it's always worth looking on eBay at the official retailer's page. During Black Friday, for instance, new Dyson vacuums were cheaper on their eBay than their official store. Tesco has a good clearance section on eBay, and Currys has a refurbished bit. How much can I expect to save on eBay? Our community of bargain hunters (which you're now a part of - thank you for coming!) found the average saving is 30%. Some, such as Sports Direct and Tesco is much more. Often, High Street retailers use eBay stores to clear stock. Old season clothes for example. Others sell returned or refurbished products through it - items that are in perfect working condition but cannot be sold as new. These are usually much cheaper, as much as 90% discount. Very has a good discount range on eBay. It's cheap already as you know and their eBay outlet store is even cheaper. Some official eBay outlet stores do offer free delivery. It varies between the brands. A while ago eBay partnered with Argos and offers free click and collect from Argos in many instances. Otherwise you have to pay standard postage fees. Great list of links! Thanks! This is a great post. Thanks Tom! Brilliant. Shedloads of thanks for this one. Time to refresh the date? This post has been updated with a new, fresh list of ebay outlet stores. I've removed old ones which are no longer available, and included some new ones as well. Hope people find it useful! Fab to have a list altogether, thanks for all yours and you teams good work Tom. In your list above the link to the Ann Summers eBay Store has expired.